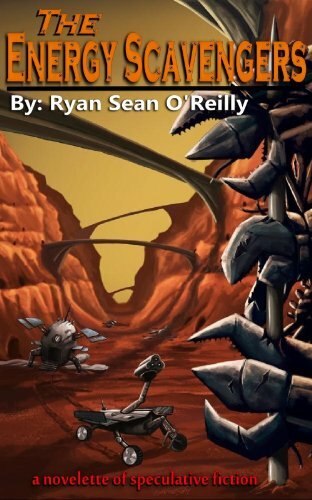 Ana Mardoll's Ramblings: Author Interview: Ryan Sean O'Reilly on "The Energy Scavengers"
Author Interview: Ryan Sean O'Reilly on "The Energy Scavengers"
Ana: Today we have Ryan Sean O'Reilly introducing their book, The Energy Scavengers. I haven't read this book myself, but Ryan was kind enough to agree to guest blog about their book to any readers who might be interested in the subject. Ryan, how would you describe your book to your prospective readers? In broad terms, what is your book about? Ryan: My story is a novelette (basically a long short story). I think my synopsis sums it up well: "When mankind reaches far out into the universe to find other life forms it may first find machines. A string of planets on the outer edges of the Milky Way contain the mechanical workers of an ancient alien civilization. Calvin an exploratory rover coupled with Nutshell his landing ship, are sent to discover what it is that all these machines are still doing–now that they’ve been abandoned by their owners. First contact comes not by hand of man, but by metal of machine." Ryan: I have had some readers tell me that my story is about faith and hope, which is odd because my initial inspiration was a hopeless and pointless notion (see below in inspirations). Yet, when I look at the completed story I do see this. It's also about sacrifice and trust. Ryan: When I set out to write the story of “The Energy Scavengers” I started out with an abstract concept. I was thinking about art in general and its place in my life. I considered how much I enjoyed discovering new masters and studying their works in hopes of inspiring my own work. Then I wondered about the purpose of my own art–was I creating merely to inspire others to make their own works. Was this the purpose of art, creating more art to influence others in hopes of creating more art? The whole thing began to appear as a sort of regurgitive cycle. There had to be some sort of outward benefit. And of course there is–art has many purposes. Never-the-less, these thoughts brought a vision to my mind. I pictured these robots left behind on some futuristic planet setting. By their own technology they were able to sustain themselves with energy long after their creators had abandoned them. But what would they be doing after they were left behind? I saw them going about, fighting and exploiting each other for the capture of energy in an endless struggle to “stay on”. What was the point? Why did they bother? Something was driving them to continue to exist, even though they no longer served their original purposes. Yet, why did they not develop their own purposes? They were simply striving to exist just to strive to exist. There was something oddly, humanistic in these questions. So I jaunted out into the galaxy to find these machines and discover answers. I found some answers and also some more questions, but that seems to be exactly what life is like. Ryan: Ray Bradbury "The Martian Chronicles". I'm not sure it's a great comparison, but this work sort of reminds me of the feeling I had when I read Ray Bradbury's work. Ryan: This is essentially my first published story. I have inspirations for "furthering" this story, but my next release will be unrelated. So far I have been writing in science fiction, fantasy and literary fiction. Ryan: My official website is here. From there you can get to my facebook page, twitter feed, blog, email, and get on my email list. "The Energy Scavengers" is available at these online stores: Amazon Kindle, Barnes & Noble Nook, Google Books,and Smashwords. Other markets will hopefully be available soon (including ibooks). Ryan: I have an animated book trailer here. Sample and preview (not a chapter as this is a short story) are available at Amazon.